Northern Pintails (Anas acuta) are fairly common winter visitors to lakes and wetlands here in southeastern Arizona, but I haven't seen large flocks of these ducks here in Tucson. 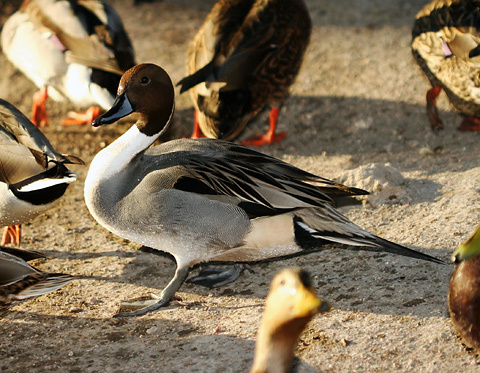 In January of 2007, this lone male Northern Pintail was begging for food with a large number of Mallards, American Wigeons, and Ring-necked Ducks at Tucson's Agua Caliente Park. A Male Northern Pintail has a black bill, brown head, a white neck with a narrow white stripe extending part way up the head, gray sides, and a long, thin, mainly black tail. 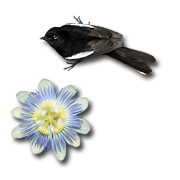 The females are a mottled brown and have shorter tails. I've never seen a Northern Pintail begging for handouts before, and one reason may be that these ducks have a low tolerance for all the crowding and jostling of the begging duck swarm. This Northern Pintail was probably the meanest begging duck I've ever seen, and he methodically bit every other duck that came within biting range. Because of this, he usually walked around in a bubble of clear space, and woe to any other duck that tried to rush in and steal any of his food.